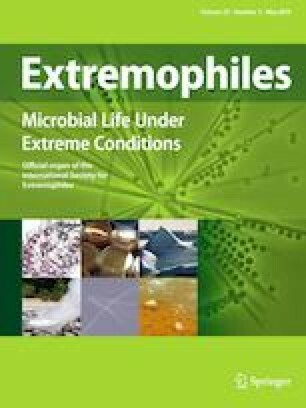 The strain Pseudomonas aeruginosa san ai, isolated from an extreme environment (industrial mineral cutting oil, pH 10), is able to survive and persist in the presence of a variety of pollutants such as heavy metals and organic chemicals. The genome of P. aeruginosa san ai is 6.98 Mbp long with a GC content of 66.08% and 6485 protein encoding genes. A large number of genes associated with proteins, responsible for microbial resistance to heavy metal ions and involved in catabolism of toxic aromatic organic compounds were identified. P. aeruginosa san ai is a highly cadmium-resistant strain. Proteome analysis of biomass after cadmium exposal confirmed a high tolerance to sublethal concentrations of cadmium (100 mg/L), based on: extracellular biosorption, bioaccumulation, biofilm formation, controlled siderophore production and a pronounced metalloprotein synthesis. Proteins responsible for survival in osmostress conditions during exposure to elevated concentrations of cadmium (200 mg/L) demonstrate a strong genetic potential of P. aeruginosa san ai for survival and adaptation. Sequencing of P. aeruginosa san ai genome provides valuable insights into the evolution and adaptation of this microbe to environmental extremes at the whole-genome level, as well as how to optimally use the strain in bioremediation of chemically polluted sites. The online version of this article ( https://doi.org/10.1007/s00792-019-01092-w) contains supplementary material, which is available to authorized users. This research was supported by the JGI, Project CSP 741 and the Ministry of Science and Technological Development of Serbia, Project III43004. The work conducted by the US Department of Energy Joint Genome Institute, a DOE Office of Science User Facility, is supported by the Office of Science of the US Department of Energy under Contract No. DE-AC02-05CH11231.